- Harmonic tremor was severe to very strong today and is still continuing that way around midnight. The IGN graph shows very strong tremor between 20:00 and 21:00 and very strong again with a lot of powerful bursts from 22:00 until the time of this update. Joke Volta spent many hours in La Restinga today. She enjoyed being there and looking at the action. She paid a lot of attention to the Salvamar, the Coast Guard ship that went to the Jacuzzi to pick up the lava stones and pieces. Click on this image to see more pictures of what she saw today. - Scientists back from the Jacuzzi confirmed report of lots of gas, sulfur and chlorine. - Vent confirmed at 1.8 km from coast. - Length of ship,' Salvamar Adhara' for comparison purposes is 21 meters. - Area of steaming stones larger + brown stain. This is the second video that we could record from the streaming images of the Telefonica eruption webcam. - Joke just wrote us about publicity for the Sunday El Hierro Volcano show! - An unfortunate backlight in all the webcams at the moment. The eruption is still taking place. - Irregular but strong harmonic tremor on the IGN graph. Ian just had a talk with a geologist. He confirmed that the present erupted material (as seen also on the picture below) is pure lava. The Restingolita stones were mixed seabed stones with new lava. What people are seeing today is "the next step" in the eruption process. "Almost over" said scientists a couple of days ago, since it had never been that active since the beginning. 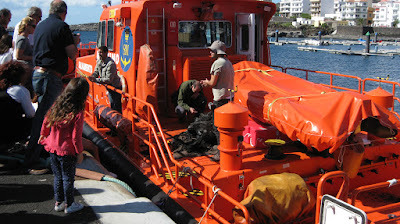 Below is a really huge lava piece which was picked up this morning by the Coast Guard boat. The boat takes a big risk in getting so near to the eruption area. If ejected and still hot, the boat could be heavily damaged by this kind of magma. We have recorded the strongest part of today's activity and time lapsed more than 1 hour's recording into 8 minutes. Enjoy the activity of the El Hierro undersea volcano! The ship (appearing after a few minutes) is a small coast guard ship taking pictures of the Restingolitas. We hope that with your help these pictures will arrive on the open internet later today. - A VERY IMPORTANT new fact we noted tonight was a shallow earthquake at a depth of ONLY 1.9 km (providing the data is correct). If new earthquakes occur at this depth, an eruption event in the El Golfo bay cannot be excluded. - Harmonic tremor is medium to strong at some times. The graph below gives an overview of the harmonic tremor from 8 AM to 10 AM UTC, or local Canary island time. The activity at the eruption area is becoming even stronger than before. The webcam operator just zoomed out a little to have a wider view. Earthquake-report.com expects more action today including a stronger Jacuzzi and from time to time a swelling geyser type action. The coast guard boat in the image will have the best pictures. What he does is however very risky as nobody can predict the start of a subaerial phase of the eruption. - The action which started yesterday with floating smoking stones is continuing this morning, hot pyroclastic material is floating to the surface. Just behind it a weak Jacuzzi has formed. All this can be seen on the Telefonica eruption webcam. - A lot of action in the sea means mostly a limited number of earthquakes. Today only 8. I went to La Restinga at first light to see any overnight developments - there weren't any - Just the usual stain but a bit closer to the shore. After an hour and as it was a lovely morning, I went sightseeing. I was returning to La Restinga when I got the message of smoking lava stones. When I arrived there were little pieces coming to the surface intermittently. These got more frequent for a while and then only one every 5 minutes. After a while the activity increased again, with a bright Jacuzzi and many stones coming up, but generally smaller than the first batch. Stones were visible on the surface. The affected area seemed to be getting larger and the activity seemed quite intense when I had to leave at 17.40. I look forward to first light! The Ian Carson images are included in the group below. Click on the image to watch the entire group of pictures. Collection of pictures (webcam and camera) of the smoking Restingolitas (lava stones). The rest can be viewed in our Picasa album of November 26. Click on the picture to watch all the images. Once again, our readers are making the difference in reporting. As we have NO money to pay for professional people we have to rely on volunteers. Earthquake-report.com is (on behalf of our readers) so happy to have volunteers like Joke and Ian, but in this case we also thank Birgit, Hans-Werner, Marchal, Kasper and Leona. During parts of the afternoon, smoking lava stones were floating on the Las Calmas sea, south of La Restinga. The best you can do at the moment is stare at our webcam. For several minutes in a row, we have seen periods of smoking magma. The smoking magma was first seen by reader Hans-Werner who also captured the image on his screen. Hans-Werner also told us that the webcam was operated in the right direction when it happened. This is also great news to hear as the webcam operators seem to have learned from past criticism. Joke reports that her friend, the La Restinga human webcam, has growing fears that a new evacuation is not far away as the stain is very visible from the village this morning (Ian reported the same in his 09:52 update). She thinks that if the wind eventually changes, La Restinga might be in the center of the storm again. - The volcanic earthquakes have picked up their daily routine again. Since 09:21 this morning 4 M+1.5 earthquakes have been listed by IGN, the strongest being a M 2.7 earthquake NW of Frontera. A lot of stain right of the coast at La Restinga but no emission points can be seen by me. I don't think the earlier mention of a closer one was true. Harmonic calm. - Why can white-topped waves almost always only be spotted in the stain waters ? - Why do we have sudden color changes in parts of the stain ? 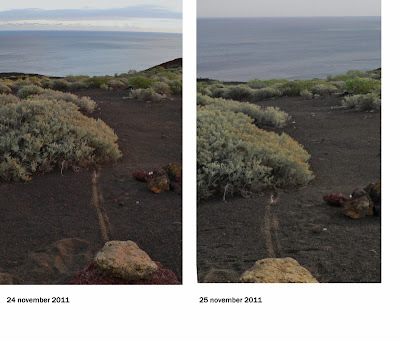 - The beautiful calm Las Calmas sea enables us this morning to trace the eruption vent. The arrow on the picture below is the location where we expect that the vent is (probably) degassing. About 15 to 30 minutes ago, we spotted here the source of a white stain. Unfortunately the Telefonica operators have since zoomed more to the left . The Telefonica operators have since zoomed the image and the probable stirring action must be located at the upper right corner. - Both phenomena are linked with each other. The degassing / eruption is continuing and hass been creating large stains since a couple of days. By taking away the pressure from the reservoir in the El Golfo area the earthquakes have almost ceased. - Harmonic tremor is still going on and accordingly it is far too soon to conclude that the eruption is over like some people are declaring at the moment. - We have cut 2 parts from this overly long article. Part 14 gives all the details from the October 20 tot October 23 period. - Only 1 earthquake was felt by the Herreños (3.1 magnitude). I was sure today that the point of emission had changed from yesterday. Sitting in the same position with my feet in the same 'ash holes', today's emission point was further to the right. I tried to show this in the attached photo, using a line I put down yesterday to mark the point. Joke has kindly put the two photos together. Click on the images to see some more pictures from Ian Carson from today. 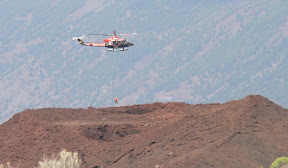 Photos of activity on Mt Colorada Cone (176m) and directly in line with vent and Puerto de Naos cone. I read before I came that they were monitoring former significant volcanoes. Look for the man in the cone on photo without the helicopter. Click on the images to see some more pictures from Ian Carson from today. - PEVOLCA has decided that all evacuated people will be allowed to return to their houses. As the La Restinga people were already allowed to sleep at home, this decision was taken to allow the return of the families of the Las Puntas area who had to be evacuated after the M 4.6 earthquake from a couple of weeks ago. Pevolca maintains however the Red Alert for La Restinga (municipality of El Pinar) and the yellow alert for the rest of the island. 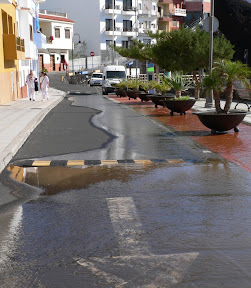 The only Civil Protection extraordinary measures that are currently maintained is the closure of the beaches of Puerto Naos and Tacorón as well as the maritime NO-GO area (radius 4 km). - The tourism sector is badly hurt by the present crisis situation. During the month of October 865 people stayed overnight in El Hierro, 351 less than a year earlier. - The museum of natural sciences in Barcelona is the first museum to show the "Restingolitas" lava stones that came floating to the surface at the start of the eruption. The stones are also sold to collectors on the internet. The initial price of 400 €/stone has decreased since interest in the eruption is slightly decreasing. - The Spanish Cantabria University has published a study that a tsunami occurs every 100 to 1000 years and that the mainland of Spain is NOT ready to sustain it. @ earthquake-report.com we can confirm that ALMOST NO COUNTRY ON EARTH is ready to cope with a mega tsunami. Even Japan, which is said to be the best prepared country in the world for earthquakes and tsunamis, has proved not to be ready for one. 2 main reasons : a) people are not behaving properly and are no longer reacting to the alert signals, and b) lessons from historic tsunamis should be used to NOT build in dangerous areas like flat coastal stretches (Fukushima is a good example). Islands like El Hierro on the other hand are relatively safe due to the hilly and mountainous landscape. Climbing 30 meters above sea level is seen as a major rescue location for a potential tsunami. Now that we have the attention of those people who read this, 3 major signs to detect tsunamis. a) a fast and unusual retreating sea, b) heavy shaking for at least 30 seconds, and c) major explosion or rockfall --- What to do ? RUN FOR YOUR LIFE TO HIGHER GROUND! The Atlantic Ocean is a minor tsunami trigger. Most tsunamis are generated by subducting tectonic plates (examples : ring of Fire and countries like : Peru, Chile, Japan, Taiwan, Indonesia, Greece, Turkey, United States, Mexico, Jamaica, etc. The countries at risk can be seen well on the Google satellite maps (steep submarine cliffs along the coast). The number of volcano triggered tsunamis (like the people currently fearing an Atlantic tsunami if El Hierro erupts) is minimal compared to the subduction earthquake tsunamis. Additional Earthquake-Report.com comment on this subject : All specialists are convinced that a lot can be done to decrease the number of casualties and to minimize the damage, but unfortunately politicians are quickly losing interest in the subject. Occasionally great initiatives are developed. One of them, GDACS, is a unique system meant to facilitate response coordination, but the computerized programs are very good in evaluating the risk only minutes after the earthquake or calamity happens. GDACS computers have huge amounts of data and are relating them to real time data from seismological agencies. Other countries have similar local or regional alert systems like NOAA, JMA, CWB and GNS Science to name a few. GDACS is the only one working for the entire world. GDACS, in full Global Disaster Alert and Coordination System, is a Joint Initiative of the United Nations and the European Commission. - PEVOLCA (board composed of Scientists, Emergency services and Authorities) is meeting at the moment. - In her "Just got up" report, Joke Volta reported a white foaming activity in the green stain. - The eruption webcam has been redirected early this morning (we don't know whether this is the result of the tough discussion Joke had last night with Alpidio Armas, the President of the Cabildo of El Hierro). Joke said to Mr. Armas that "amateurs" are handling the webcams and that the "world" was looking at the activity, citing the number of users from outside El Hierro. She said also that this was the worst publicity the island could get. - If the faint activity on the eruption webcam will be confirmed later on, we have to speak of a major shift of the active vents as we have the impression that the stirring is much closer to the coast than before. We are anxiously waiting for new GPS data. Update 08:15 : in the meantime the camera has been moved. Update 10:43 : Ian checked the earlier described position and could NOT find any evidence of a new vent. - Strongest earthquake measured M 2.8 and was felt by the people of El Hierro. - Depths today in between 15 and 21 km. - Harmonic tremor is stable. The images below have been taken by the Involcan and Guardia Civil helicopter flight from yesterday morning November 23. They have been published today. Within a hour it was repaired, the pipe ran parallel to the coast and had a 150 mm split in it, perhaps from bending... A coincidence, who knows, but it happened in Dante's Peak. Spoke to a Geologist today at Naos mountain, where we normally watch. There is a self-contained, solar powered monitoring station very close-by. Apparently this is a magnetometer to measure changes in magnetism as a result of magma movement. - Ian reported that the bursts on the harmonic tremor graph are coinciding with stronger activity in the stain, although he also said that he could not see magmatic material floating to the surface. - Some people talked of a sulfur smell in the El Golfo area. Inspection teams have been examining the situation. Their findings are not yet known. Ian, who also went to the El Golfo area today, could not confirm the smell. - GPS deformation of the island is showing an inflation of the Tanganosoga volcano area and a deflation of the La Restinga peninsula. The data used is from November 10 until November 21. Click here to read this article. - Joke will be disappointed to see the webcams this morning. She just mailed that she sees some kind of Jacuzzi activity from El Pinar through binoculars (some kind = not sure), but none of this can be seen on the webcam. - Only 1 earthquake at a depth of 24 km since midnight UTC ! This is probably the quietest night in a couple of months ! Volcano Discussion Panel : If you are someone who would like to discuss and read about all aspects of volcanoes, this discussion panel might be a very good place to hang around. Especially if we start speculating about what to happen next, this panel is a great place to look at. Give it a chance.